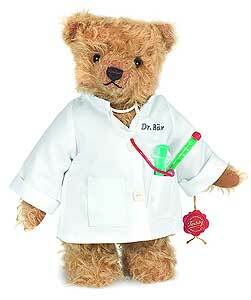 Doctor Bear Teddy Bear by Hermann Teddy Original EAN 146315. Made of the finest mohair. fully jointed, with stethoscope, Limited Edition of 300. Surface washable only, Size 28cm (approx. 12 inches).